It’s been months since we last heard Dan Aykroyd discuss details for Ghostbusters 3, then ignored those details in favor of doing literally anything else, such as accepting that the past is the past and growing as people. Yet Aykroyd is still out there nattering into the void, this time in the form of Larry King—Aykroyd’s repeated insistence that the sequel is happening (despite any official word from Sony or anyone else that might be involved) finally being met with the serious journalistic inquiry it deserves. “It's based on new research that's being done in particle physics by the young men and women at Columbia University,” Aykroyd said of Ghostbusters 3 and, quite possibly, his belief in a parallel universe that would be hospitable to another Ghostbusters film in which they’re all old and Bill Murray isn’t there. “Basically, there's research being done that I can say that the world or the dimension that we live in—our four planes of existence, length, height, width, and time—become threatened by some of the research that's being done. Ghostbusters—new Ghostbusters—have to come and solve the problem,” Aykroyd added. And so he left you to draw your own conclusions about the dangers of messing with time and expanding universes, as it pertains to making Ghostbusters 3. 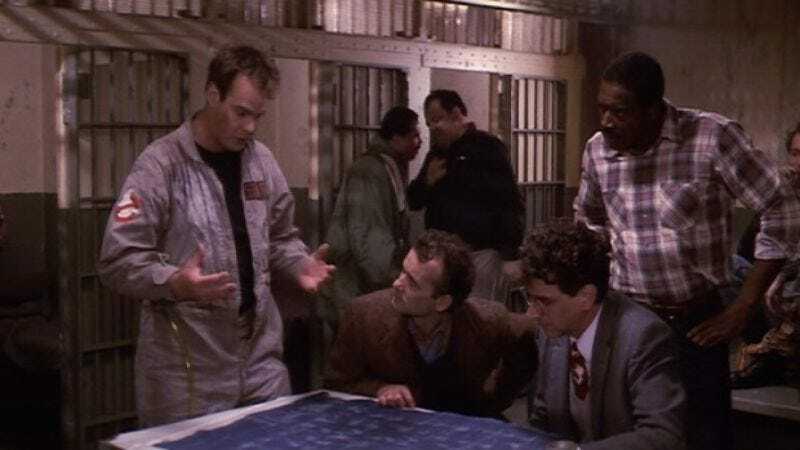 This follows Aykroyd’s other recent assertions that “the Higgs boson and the particle theories, gluons and mesons… really gives us a scientific base in terms of our fictional storytelling, to open up to another dimension and have something horrible come through”—again, apparently without realizng this could also apply to “opening up” further dimensions of Ghostbusters, because not even Dan Aykroyd is listening to Dan Aykroyd anymore. Whether anyone will stop that dimension from being opened and something horrible coming through, either on-screen or off, remains to be seen, though Aykroyd acknowledges it still probably won’t be Bill Murray.